Anyway, trying to get Zachary to try these white chocolate Reese’s muddy buddies was like asking him to drink poison. He did it in the end and actually ended up liking them. Which is saying something. As for me, I couldn’t keep my hand out of the bowl. I loved the pop of peanut butter when I’d get a bite of a Reese’s! Don’t be hatin’. At least give them one try. Pour cereal in a large bowl. Pour the mixture over the cereal and combine until the cereal is evenly coated. Put the cereal in a gallon size ziploc bag and add the powdered sugar; shake until the cereal is completely coated. Add the Reese’s and continue to shake until well combined. 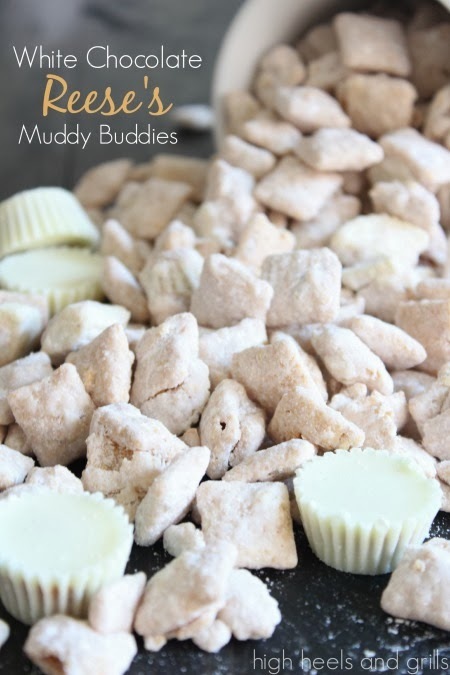 OBSESSSSING over these incredible muddy buddies! Never thought to do a white chocolate and peanut butter version, but actually, that’s my preferred combo! White chocolate allll the way, baby!